Sailing’s a unique sport. Athletes at all levels travel throughout the year, meaning recovery is an essential component to success. Fred and Mike are not only tailoring individualized programs for each athlete’s schedule, they’re also focused on teaching these sailors that more competition is not always necessary. Instead, these athlete often benefit from more time training on land and less in the stressful and taxing state of competition. As a sport historically unfamiliar with performance training, SPT practitioners evaluate athletes often, never forgetting to take the time to communicate with each member to help improve buy-in and establish a trusting relationship. As ex-professional athletes themselves, Mike and Fred understand the physical as well as psychological impacts of the sport. Their mission is to educate and support the sailing community through innovative performance training. SPT has created a systematic approach to assessment and periodic evaluations to allow them to capture and evaluate a variety of performance-impacting data to make the most informed decisions. For instance, they’ve proven many athletes experience a cycle of systemic and weight increase as well as sleep loss over weekends. While they may be able to buy back some of that rest during the week, this suggests that during their competitions athletes are likely performing at a less-optimized state. Thus, their team is able to adjust training and manage travel in a variety of ways, more tailored to each athlete’s needs. Like any of their athletes, youth sailors are taken through a variety of assessments upon their first few weeks of training with SPT. The team of coaches look for a variety of factors that will impact the athlete’s overall success throughout a program. The SPT team believes taking the time to thoroughly evaluate and assess movement patterns and deficiencies in even the youngest of athletes is essential, especial when offsetting the effects of early specialization that many youth athletes are exposed to. Tune in to hear the specifics of their evaluation and early education process as well as how the SPT athletes are adapting to a new environment, with less focus on sailing and perhaps more focus on soccer, water polo or skiing. Mike & Fred try to combat early sport specialization by prescribing other sports to help their younger athletes excel on the water. They’re not afraid to teach these athletes that a well-rounded athlete, performing across a variety of youth sports, is often the athlete destined for longer-term, injury-less, success. Fred and Mike are using innovative technologies to help them effectively monitor their athletes well beyond their workout. This has allowed them to hypothesize and test, leveraging a variety of data from each one of their athletes. From sleep variance, systemic stressors and weight fluctuation, Fred and Mike have developed systems to improve performance well beyond the water. 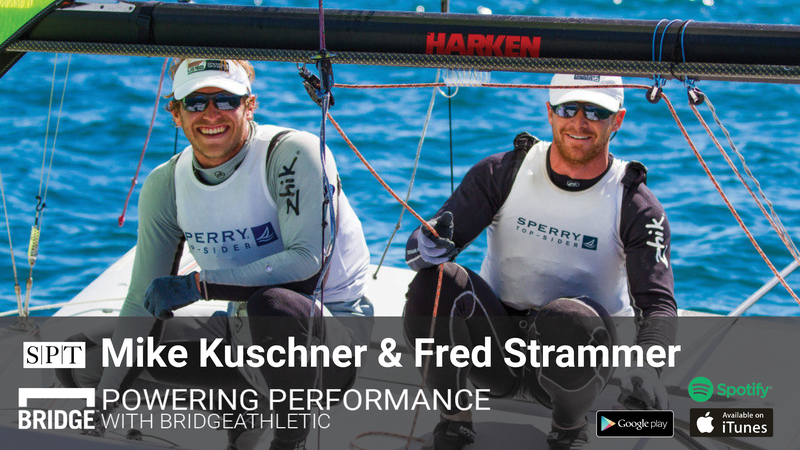 If you’re a sailor ready to compete at the highest level, a novice seeking support and improvement or simply a great coach interested in connecting with an innovative team, connect with Fred and Mike! Thanks again to Fred, Mike and the entire SPT team for choosing Bridge to help power their performance!